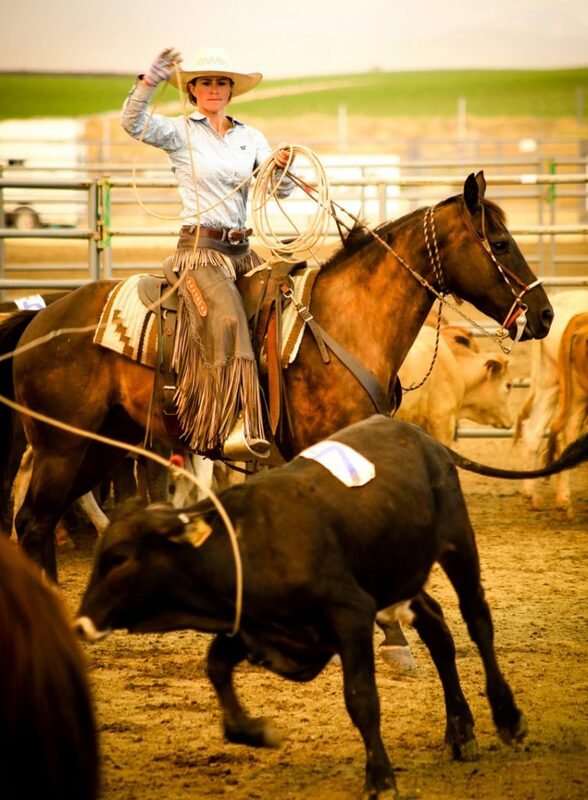 Dwight Hill holding the steer for Emme Randall’s heel shot. Photo by Marc Alt. 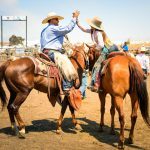 The Californio Bridlehorse Association’s (CBA) 5th Early Californios Skills of the Rancho was held in Santa Maria, California on July 6-9, 2017. 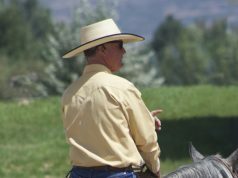 CBA’s President and founder Bruce Sandifer has credited his friend Ray Ordway as an inspiration for him to learn and share with others the ways of the old masters of the California bridle horse system. 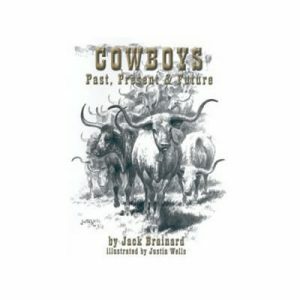 Ninety-three year old Ray is one of last true vaqueros, a title he earned when he and his father worked cattle on ranches where men rode spade-bit horses with the lightest touch and roped with a reata. 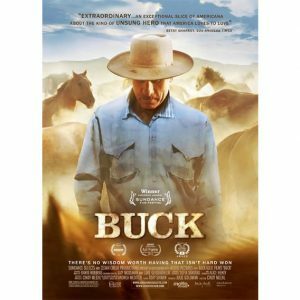 Bruce and Ray have shared a vision where the values and skills of the early California stockmen and bridle horsemen would be preserved and passed on to future generations. 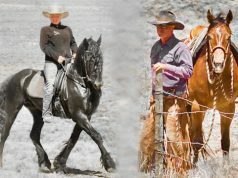 The intent to resurrect this practical and useful California system was the catalyst for the formation of the Early Californios Skills of the Rancho. 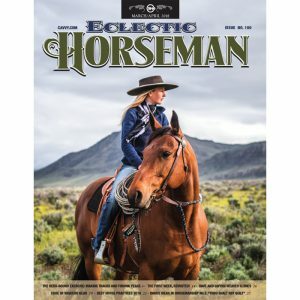 Criteria used to evaluate riders were those that make a good bridle horseman “jaquima a freno,” to ride in the hackamore, the two-rein, or straight-up one-handed in the bridle. 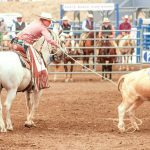 Judge Wacey Kornemann explained the importance of the California tradition in his work as a ranch foreman, “We don’t need to rush anything anymore. 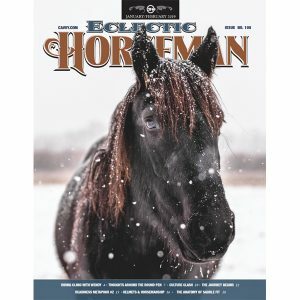 Bringing our horses along at a slower place and taking time to train our cattle makes for better horses, better cattle and better hands…we don’t just go and get a job done but we take pride in the quality of our gear, the handle on our pony, and the efficiency of our stock handling.” That sentiment was a core ideal at the Skills where cattle work was not judged for speed but for how smooth, efficient and calm the rider and horse worked without added stress on the rodear. 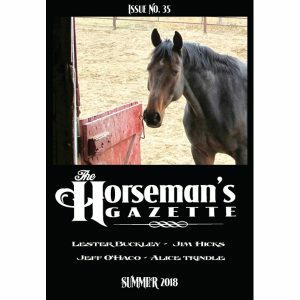 One of the best bridle horsemen, Jim Prewett. Photo by Marc Alt. David Morrison congratulating his daughter Karinae on her Junior Doctoring run. Photo by Marc Alt. Maggie Hammon catching heels while her sister Rachael heads in the Mixed Ladies Doctoring. Photo by Marc Alt. Mollie Dorrance Lambert 1st place in Intermediate Doctoring. Photo by Marc Alt. 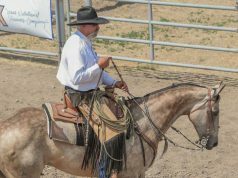 The Skills of the Rancho brought together like-minded horsemen and craftsmen to exchange ideas, sell gear and display their talents. 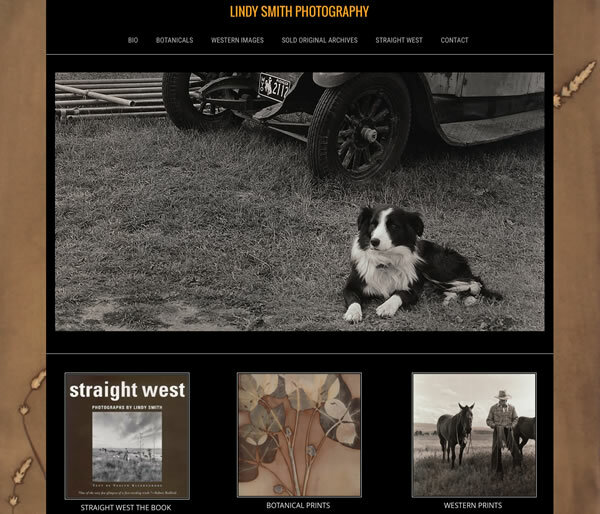 Newly added Ranch Horse events started under a clear sky with a cool ocean breeze at noon on Thursday. At 5:00 p.m. smoke from a wildfire fire was spotted on a nearby ridge. 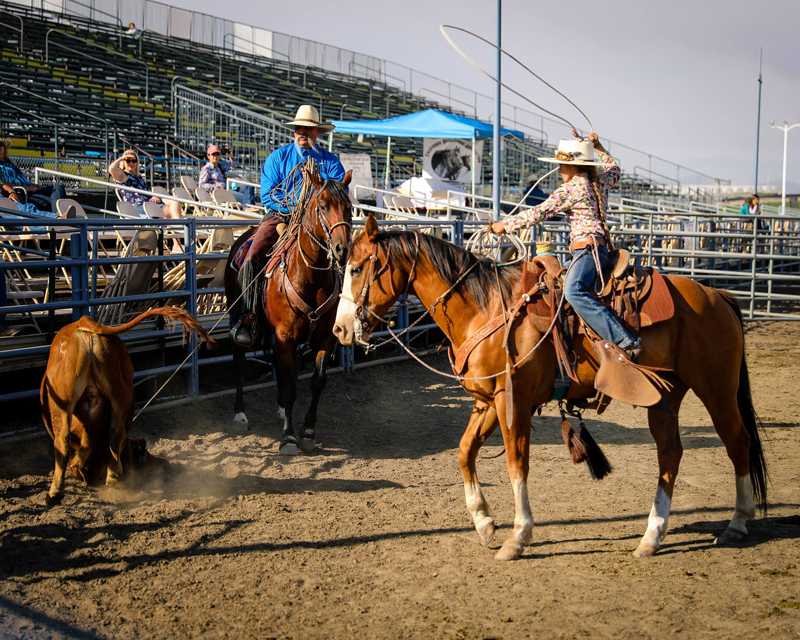 Later Thursday evening vendors and competitors began to share the Elks Rodeo grounds with a make-shift city for several thousand fire crew members and the evacuation site for animals impacted by the fire. Local news on the fire discouraged some spectators from attending the Skills competition. Those people missed out on the opportunity to purchase incredible gear made by some of the best vaquero artisans known today and to enjoy the free Mike Beck concert. 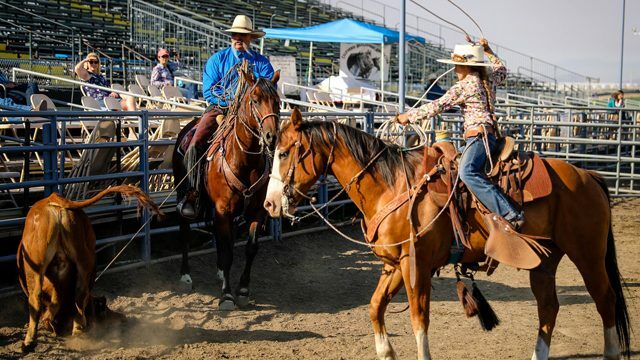 Behind the scenes volunteers moved horses and trailers to make room for evacuated animals while Bruce tightened the schedule and announcer Jeffrey Mundell kept the event moving so the rodeo grounds could be cleared for the growing fire camp. 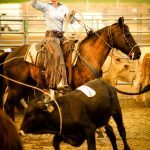 Horses, cattle and riders were unfazed by the drone of slurry bombers and helicopters with water buckets that flew overhead. While the fire had little effect on the competition, it kept vendors busy dusting ash from their wares. 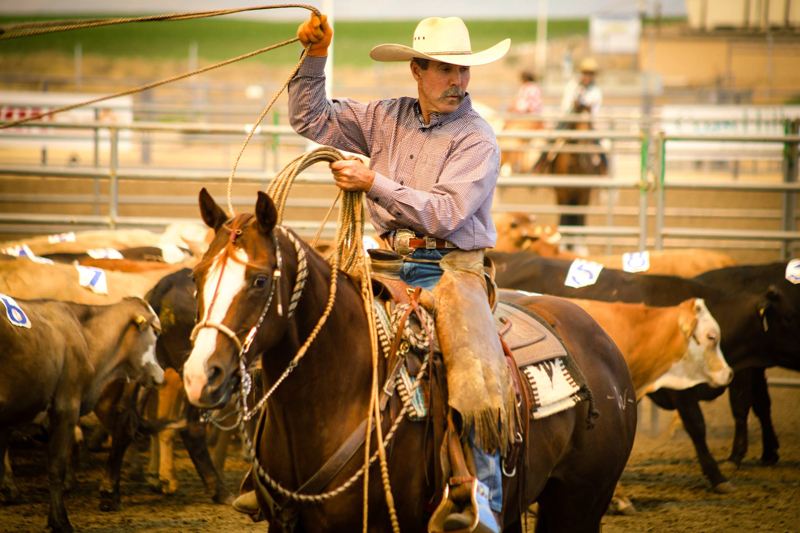 The pros in the Open division were the epitome of the California vaquero. 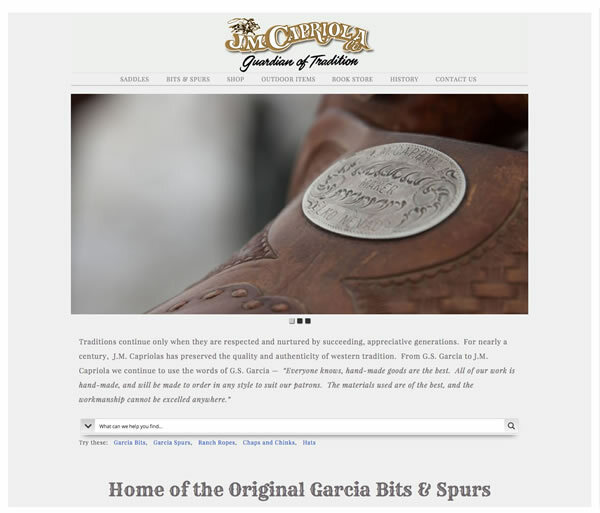 Their passion for the California Vaquero tradition was evident in their dress and tack, often the best example of western art from celebrated saddle and bit makers. Fifteen three-man teams competed in Open Doctoring with hopes to win Bruce Haener spade-bits. 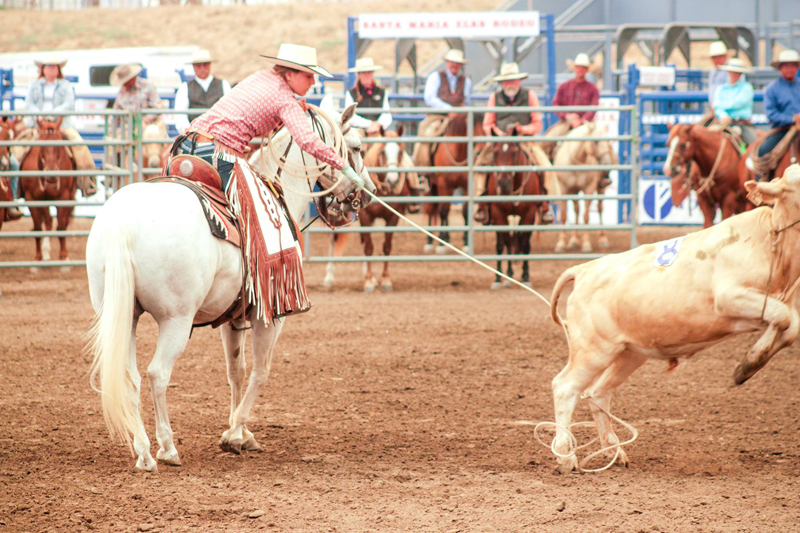 Spectators were treated to impressive teamwork, steady stockmanship and fine reata roping. The team of Dwight Hill, Scott VanLeuven and Mark Lundy won the class but their work didn’t stop there. 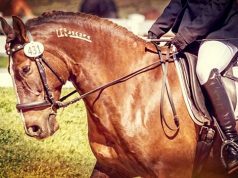 Like the other pros they held rodear, did ground work and roped heads or heels for anyone who needed help in the Intermediate, Novice and Youth divisions. Most pros competed again in the two-person Mixed Ladies Doctoring with daughters, wives and friends. Michele and Jim Prewett placed 1st in the division with perfect partnership. However, it was evident by the smiles, high fives, relief and sense of accomplishment which followed every Mixed Ladies Doctoring team’s run that there were many victors. 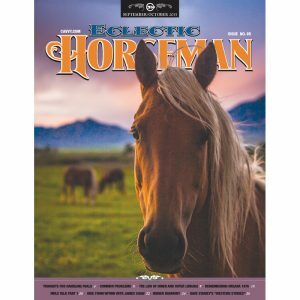 Regardless of experience, background, gender or age a special sort of horseman can be found at the Skills. 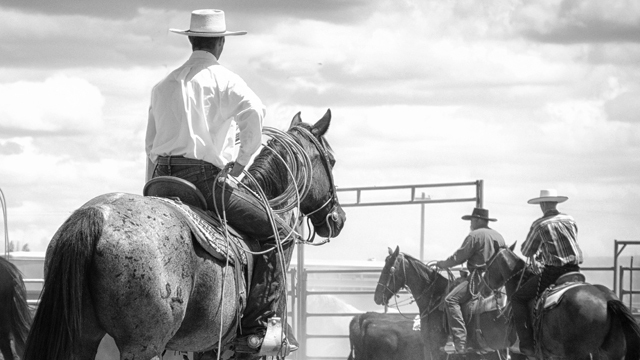 They are people who respect the horse, the tradition, the cattle and each other, values Ray Ordway deemed part of the true Vaquero culture. It was in Ray’s name that a new award was created this year for a competitor in each division who best demonstrated these values. This first year’s Ray Ordway Top Hand buckle was given to Scott VanLeuvan in the Open division, Ray Juarez in the Intermediate division, Rachael Hammon in the Junior division, Eli Morrison in the Youth division and Jennifer Denison in the Novice division. 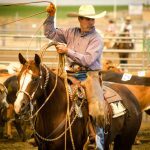 The 2017 Early Califorinos Skills of the Rancho is a testament that the bridle horse tradition has grown in popularity. Twenty-four contestants were awarded a share of the $9,275 payout. 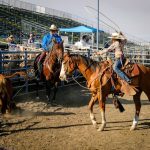 In addition to hard cash there were thousands of dollars in prizes donated by generous vendors and sponsors to ensure the success of this event. The prizes were awarded to 122 places of which 24 were in the 17yrs or under divisions and over half of those youth rode straight-up in the bridle. 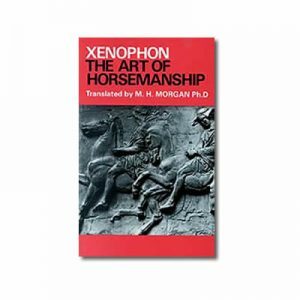 The Early Californios Skills of the Rancho is not just a competition. The CBA has always worked to create a family event with a fiesta atmosphere. 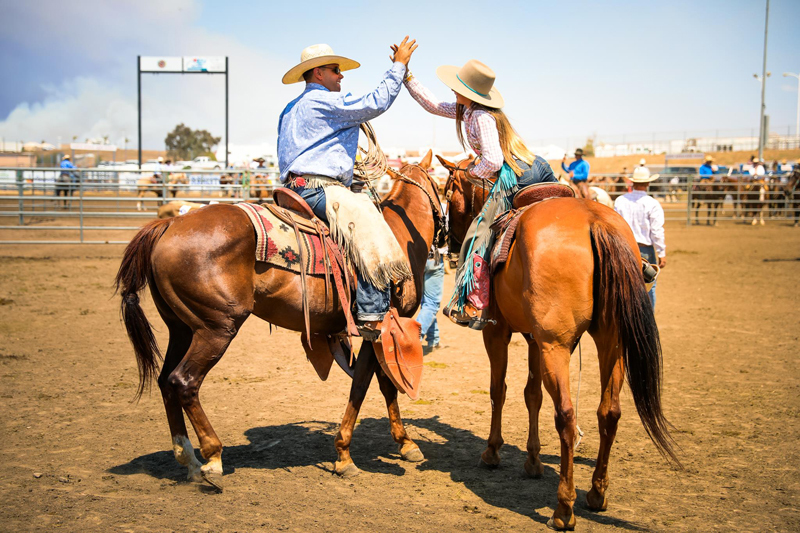 But more than an event or competition, the Skills of the Rancho is an experience that should not be missed by anyone interested in the California vaquero tradition.